Thirty-six of the most interesting writers in the Pacific Northwest came together for a week-long marathon of writing live on stage. The result? 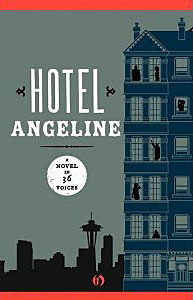 Hotel Angeline, a truly inventive novel that surprises at every turn of the page. Something is amiss at the Hotel Angeline, a rickety former mortuary perched atop Capitol Hill in rain-soaked Seattle. Fourteen-year-old Alexis Austin is fixing the plumbing, the tea, and all the problems of the world, it seems, in her landlady mother’s absence. The quirky tenants—a hilarious mix of misfits and rabble-rousers from days gone by—rely on Alexis all the more when they discover a plot to sell the Hotel. Can Alexis save their home? Find her real father? Deal with her surrogate dad’s dicey past? Find true love? Perhaps only their feisty pet crow, Habib, truly knows. Provoking interesting questions about the creative process, this novel is by turns funny, scary, witty, suspenseful, beautiful, thrilling, and unexpected. Whether you like this book or not might just depend on why you are reading it. If you are curious about a novel written by 36 different authors in 6 days this is for you. It is quite an amazing feat and in many aspects quite impressive. The writing, as expected, is quite impressive. I was most impressed with the fact that the characters were the same throughout the work. I didn't feel as if I was reading 36 versions of each character. Alexis (isn't that such a wonderful name), the main character and protagonist, was consistent throughout the novel which I think is quite an accomplishment in a book like this. Again, the writing was impeccable. BUT. If you are reading this for a relaxing read by the pool, you might just be disappointed. I thought this book was about saving a hotel, Hotel Angeline. But it involves the coming of age story of a 14-year-old, death, identifying a parent, discovering the truth about the past, sexual and identify confusion, a terrorist/conspiracy plot, running from authorities, saving a hotel, starting over, and everything that has to do with all of those issues. It was just too much going on. To be fair, this was probably a technique that was used in order to make sure the novel flowed since it was written under pressure by different authors. I think this technique worked in terms of achieving a well-written work, but it did not work in terms of producing an enjoyable read. Read this if you are curious about the process and the outcome. It was quite an amazing accomplishment but not that fun of a read.